Christmas 2017 included some gifts from my wife to feed my Amateur Radio spirits. Principal among them was a BITX-40 kit. 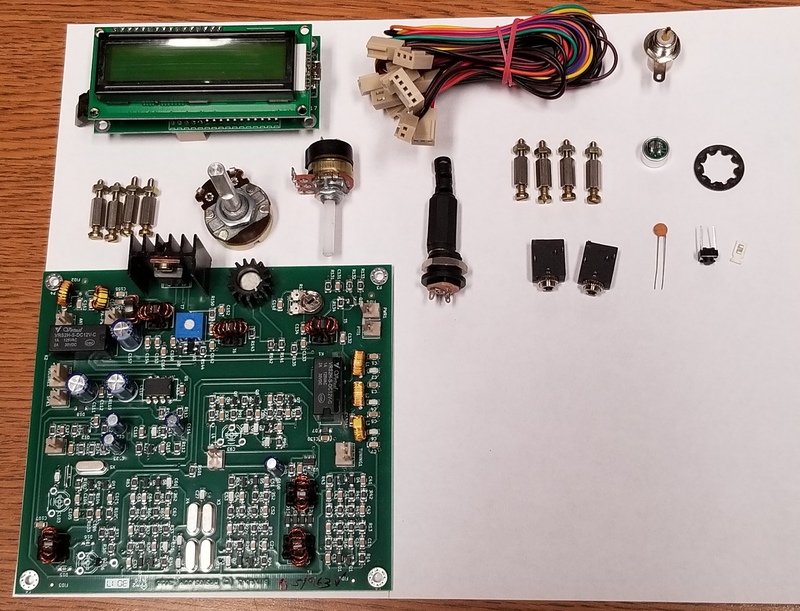 This is a VERY inexpensive kit designed by VU2ESE and sold for $59. 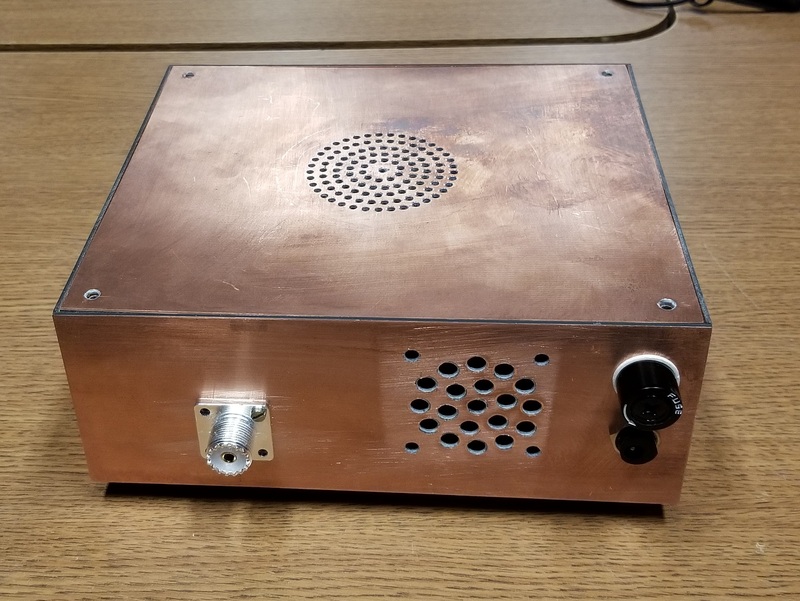 Actual cost will rise based upon the availability of an enclosure, microphone, 12 vdc power supply, and speaker in your shack/junk box. This kit was a lot of fun. 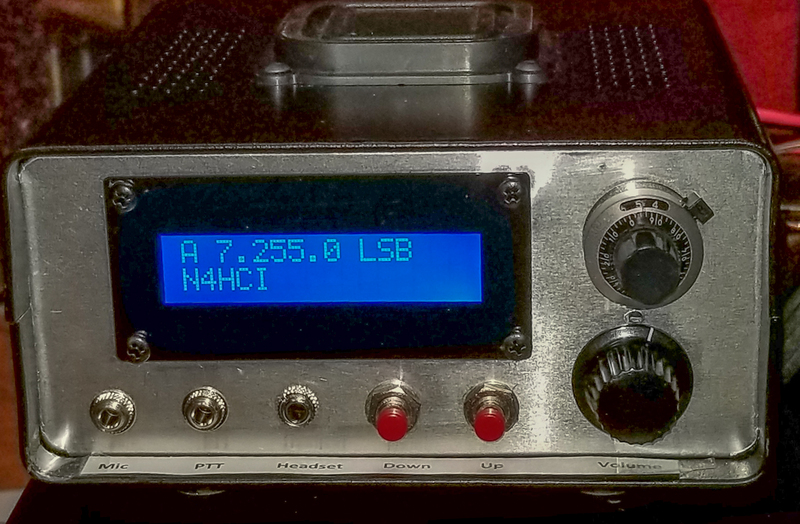 For this first such kit since my Heathkit days, I chose buy a small enclosure, a small speaker, and some knobs. Other items were in the junk box. Unlike WA4THR (see his BITX-40 experience here), I did not hack this design, preferring to build it and use it as designed, at least initially. Ultimately, I did install a software mod that greatly improved the user interface and information presentation. 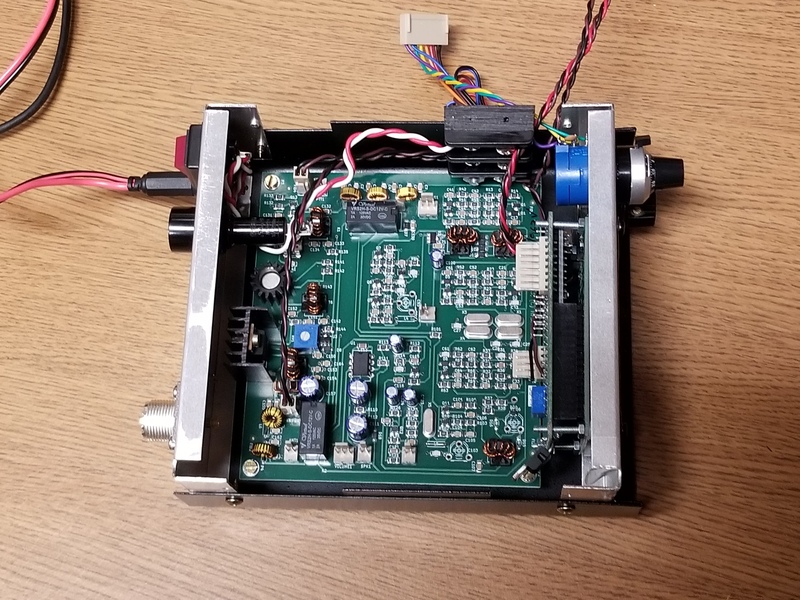 The only hardware changes in my first build were the addition of a switch to shift the radio to the software update mode, the addition of a terminal panel in the radio for distribution of 12 vdc to various points, and rewiring of an old IC2-AT microphone to make it compatible with the BITX-40. A simple kit box was acquired and it was assembled. This photo is a work in progress showing a tight fit. This was NOT the end of it. The BITX-40 is a 40 meter radio. 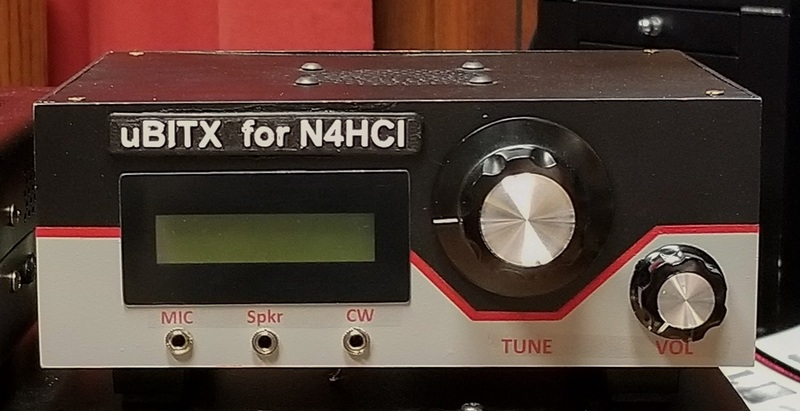 In Dec 2017, HFSignals released a brand new transceiver called the uBITX, which is a general coverage receiver and covers all ham bands, for only $109. So, I convinced my wife that her Christmas gift also included the uBITX but that it remained to be ordered. She agreed and the order was placed, including a $10 premium to have the shipping handled by DHL, instead of the Indian Postal Service - which is a 3 week delivery prediction. Alas, what I overlooked when I ordered was that the uBITX had suddenly become very popular and had a huge waiting list. Delivery eventually became 2 months even bypassing the Indian Postal Service as they cleared the backlog of orders in front of mine. 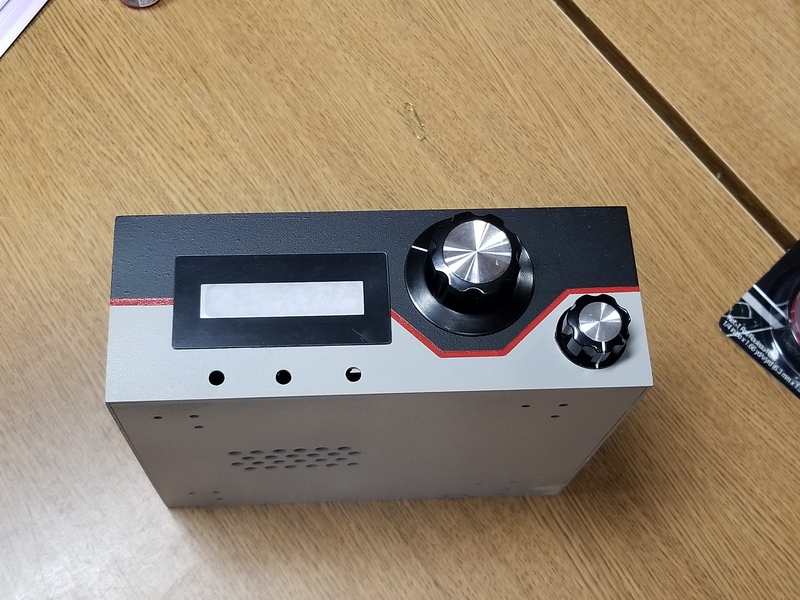 So, with time on my hand, I decided to build the enclosure for the uBITX. 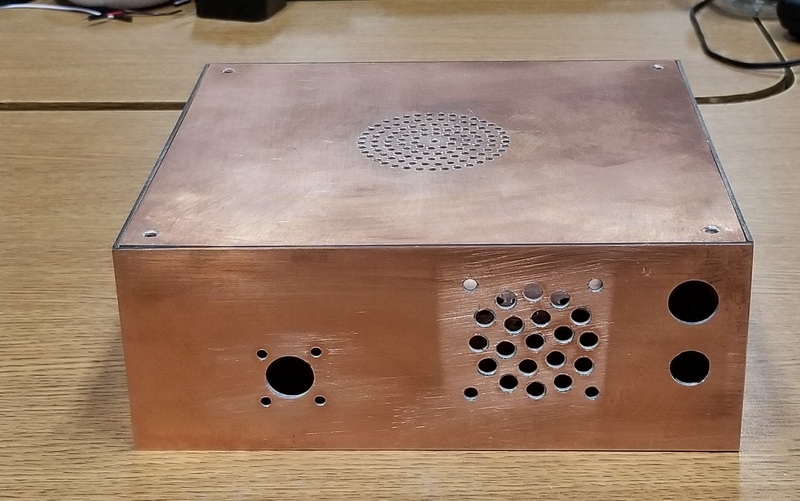 I found a reference to making enclosures out of printed circuit boards, and I happened to have a good supply of unused double sided PCB material from a previous project. 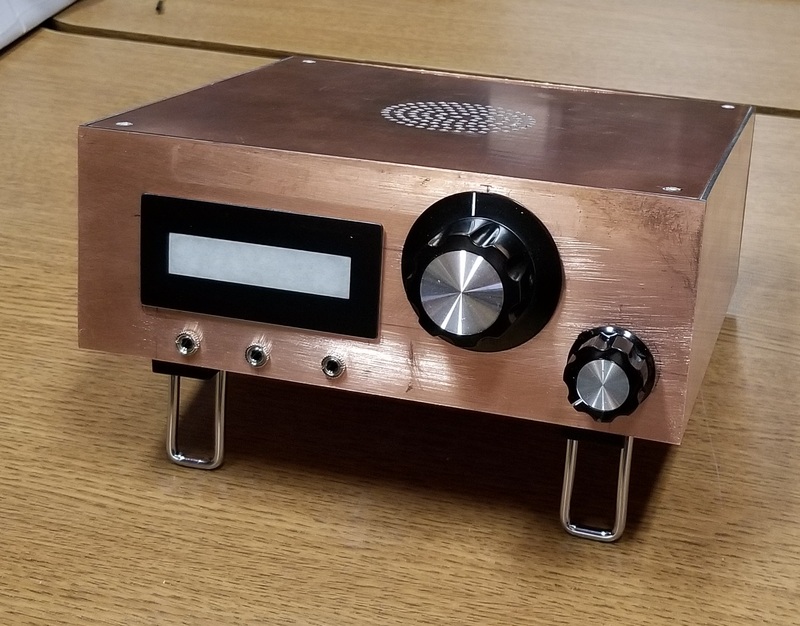 Based upon my experience with the slightly small enclosure for the BITX-40, and WA4THR's BITX-40 experience with making physical modifications to the radio that consumed space over that of the basic HFSignal kit, I decided to make this enclosure larger than seemed necessary by the size of the uBITX circuit boards. I settled on 8" wide by 7" deep by 3" tall. A design was sketched out for a bottom, top, front, rear and 2 side pieces. 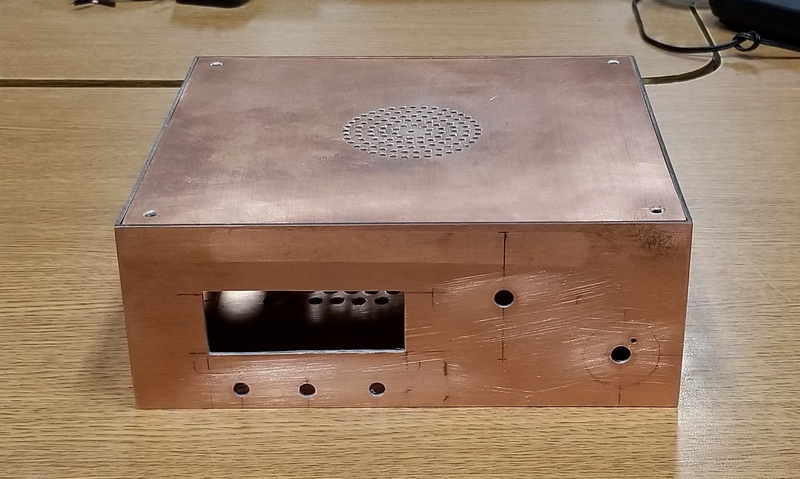 Parts were cut out of the stock PCB with a saber saw after scribing cut lines on the PCB material, edges were sanded, and then the pieces were soldered together using a 150 watt soldering gun inherited from my father. The instructions that I'd read on soldering PCB material together cautioned me that solder shrinks and caused circuit boards that are soldered at a 90 degree angle to actually be 88 - 89 degrees when cooled. 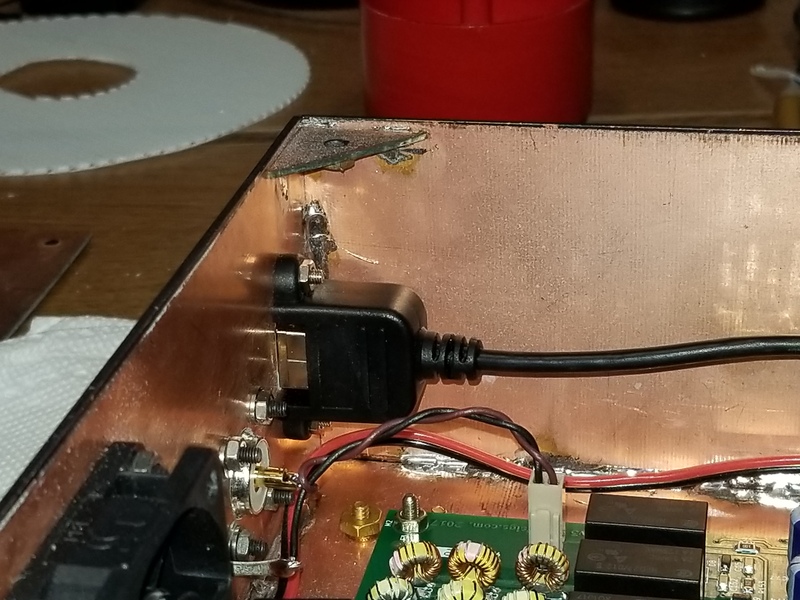 He provided a way to avoid this problem by increasing the angle to 91-92 degrees before soldering - but I thought that I had a better way, and chose to use picture frame clamps to force the cooldown to occur while the PCB material was fixed at 90 degrees and could not move. Alas, for some reason, that did not work [Teaching Moment: The stupid shall be punished] The consequence of ignoring this sound advice was not too bad and I was able to proceed, although the end result would have been better if I had heeded the lesson learned. 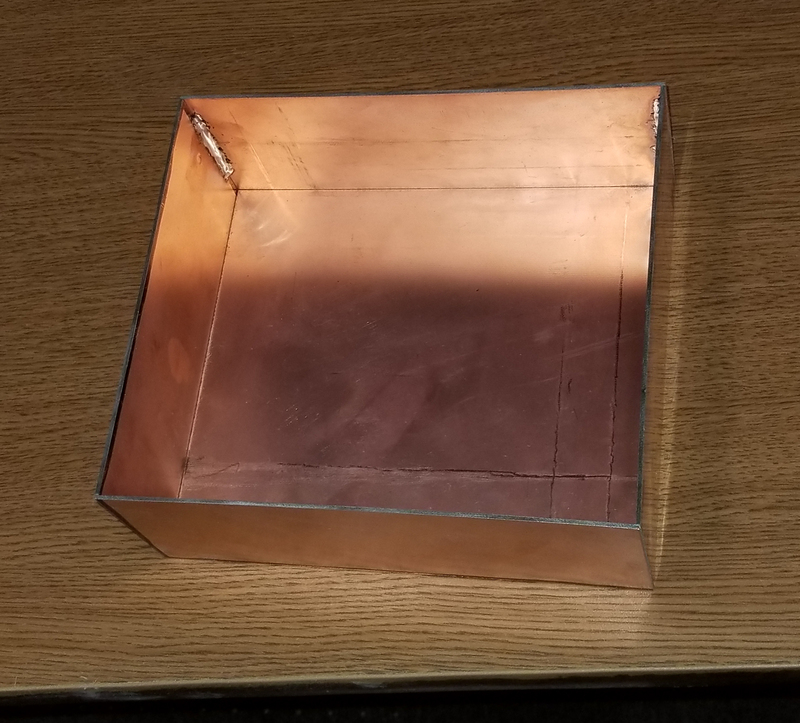 The following pictures provide the results of the enclosure project. The rest of the parts were assembled inside to check out fit up. After the parts were reinstalled in the enclosure, the rig was lit off, calibrated, and tested. But there are always changes to be made. The Power/Volume control in the kit used an abnormal small size shaft for which my knobs were NOT suitable. 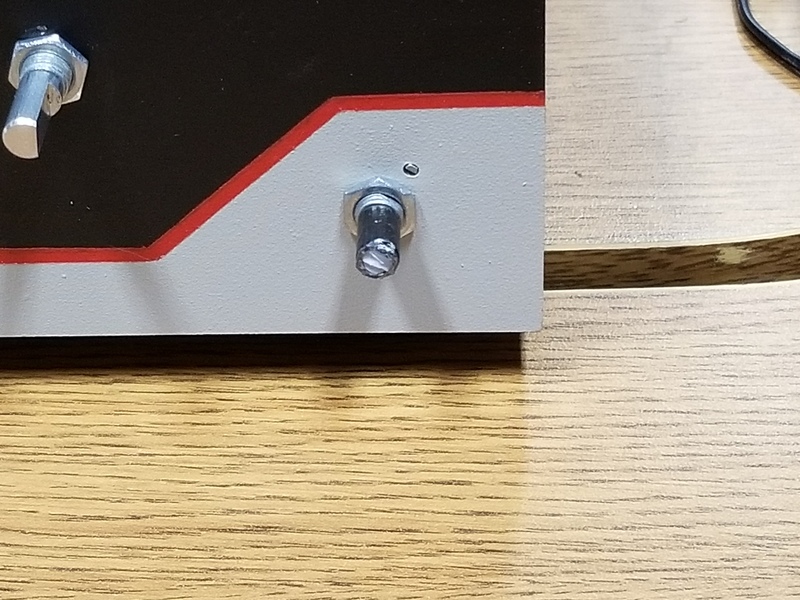 So I decided to make an adapter to fit on the small knob shaft, using a 3D printer, which would enlarge the shaft to the 1/4" size the knob was expecting. 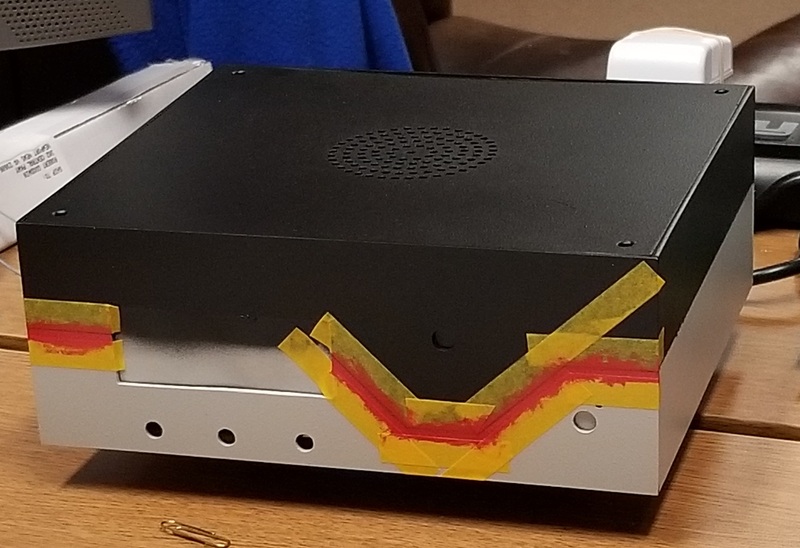 Then, it was all ripped apart and a cutout made for and a USB extension cable installed to bring the internal USB connection out to the rear panel so that software changes could be make without opening the radio and with an eye to eventual CAT control of the rig. Finally, I found an improved software package and installed it for improved user interface and control.